1) Neil has a Biel Tan army. 2) I've only played an eldar army once before and that was about 25 years ago. 3) The person I played was called Richard. Heavy Support;Support Weapons. 3xSupport Weapon: Shadow Weaver. Veterans Veteran Sergeant: Chainsword, Laspistol. 6x Veteran w/ Lasgun. 3x Veteran w/ Special Weapon: Plasma gun. Veterans . Veteran Sergeant: Chainsword, Laspistol. 6x Veteran w/ Lasgun. 3 x Veteran w/ Special Weapon: Meltagun. Heavy Weapons Squad. Heavy Weapon Team: 3 x Autocannon. Heavy Weapons Squad Heavy Weapon Team: 3 x Heavy bolter. 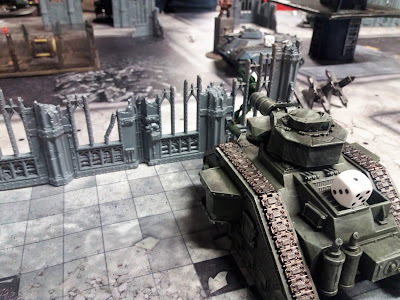 Leman Russ Battle Tanks ; 3 x Leman Russ Battle Tank: Battle Cannon, Lascannon, Plasma Cannons, Storm Bolter. So the plan is (as usual); The heavy support softens up the enemy, my two veteran squads in chimeras move forward to engage whatever threats seem applicable and the infantry troopers are there to soak up shuriken and possibly grab an objective or two. I gave the Laurels of Command to my warlord as the additional order may prove useful, that and the fact Grand Strategist and Kurov's Aquilla had been nerfed in the latest FAQ. 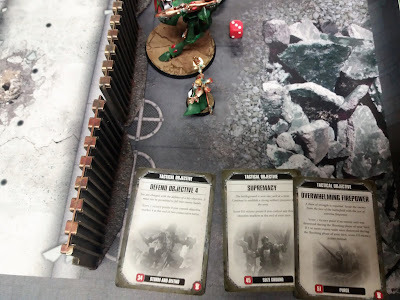 We played Cleanse & Capture and Neil chose the set up type, it was Vanguard Strike - the one where the deployment zones are opposite diagonals to each other. 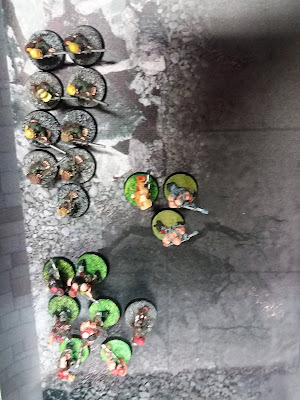 After set up I won the roll for setting up snipers, so I placed the Ratlings in a fairly central position hoping to snipe some toughness 3 Aeldari characters and Neil placed his own further from the centre. Neil's set up jiggery pokery had his support weapons in a ruin alongside his Farseer jetbike (these were pretty close to my Ratlings) and Dire Avengers. 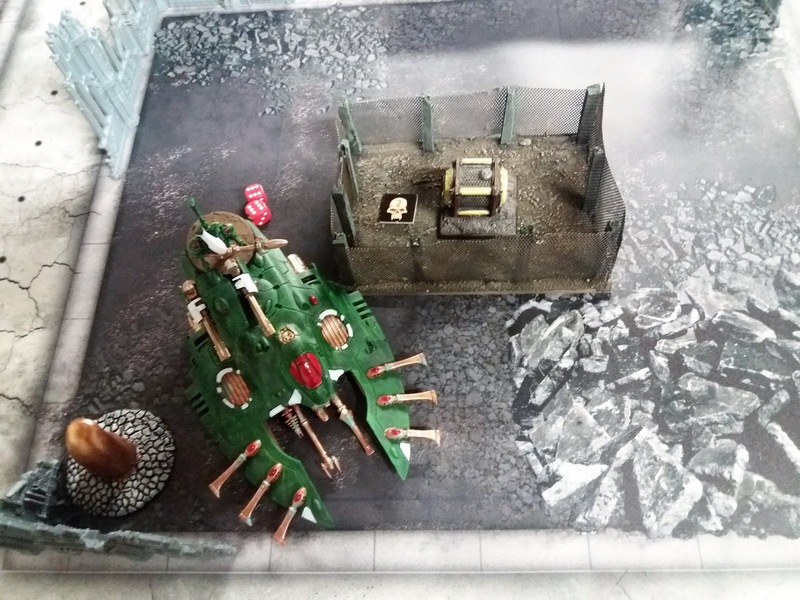 Next to them was a Wave Serpent filled to the brim with Wraithblades avec Autarch. 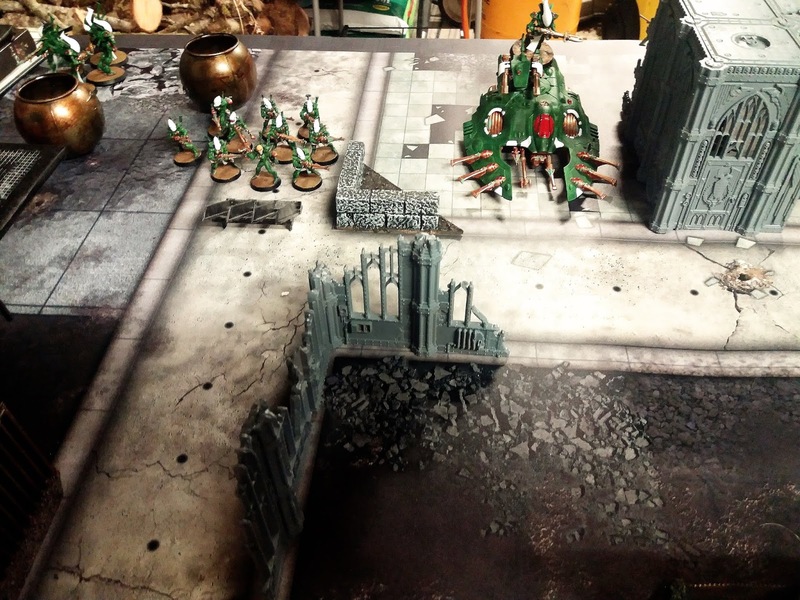 To the right of the support weapons were the Guardians and another wave Serpent with Wraithguard in them. In the webway was the Spiritseer and yet more Wraithguard. 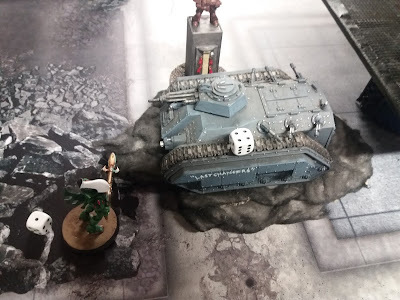 To further irritate the two Warwalker were gamboling in a meadow somewhere close-by, ready to inflict hot Eldar beams of death on my brave xenophobic guardsmen. 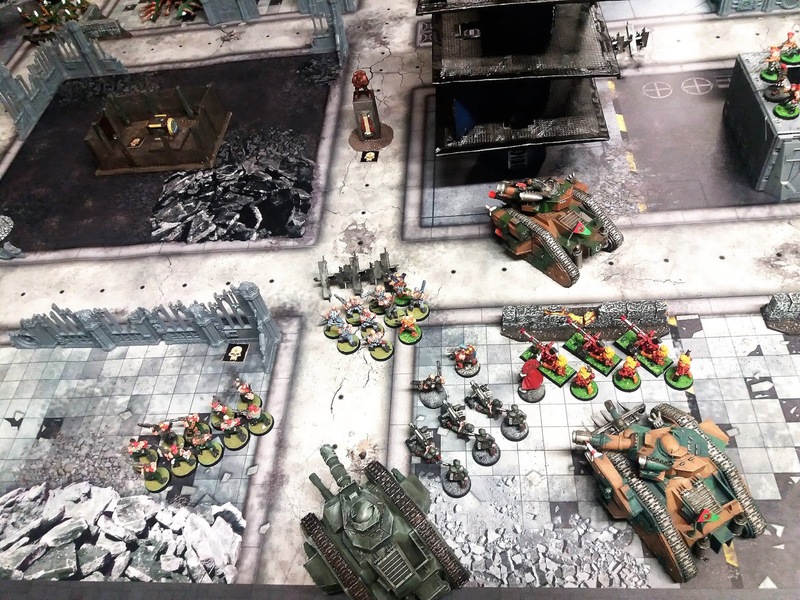 The partial set up picture with a heavy weapon squad, Leman Russ, infantry squad, Chimera with meltagun vets, another chimera (this time with Plasmagun vets) and a Hellhound. 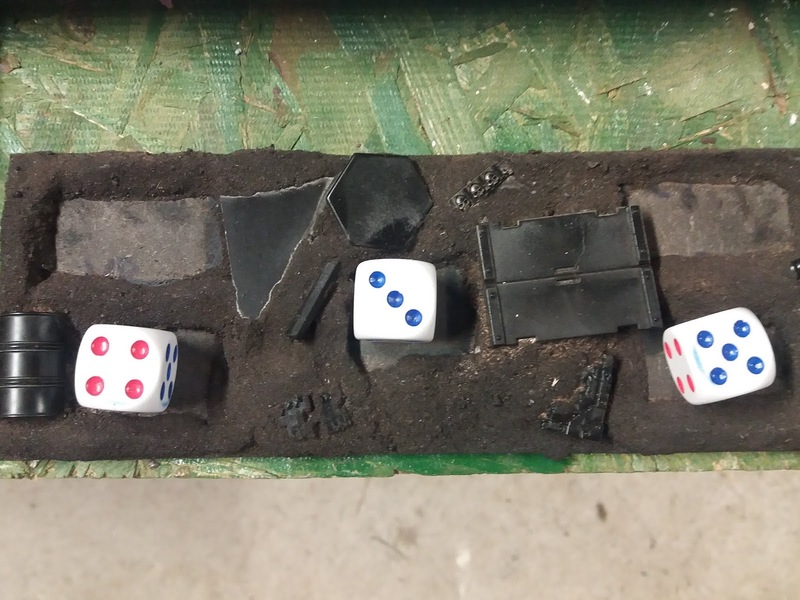 Also featured is my brand spanking new battlemat. To the west of the previous picture, two more infantry squads, two more Leman Russ, heavy bolter squad, Sergeant Harker, Primaris Psyker and Company Commander. 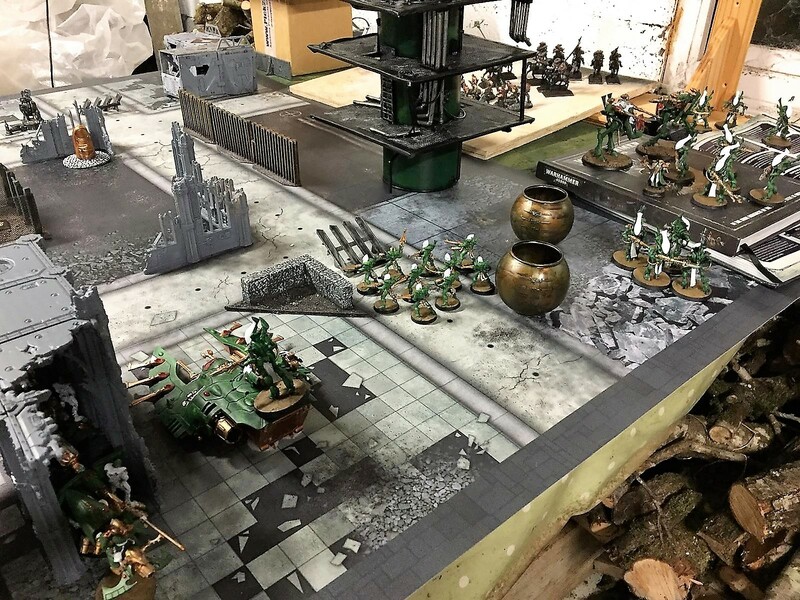 Just across the battlefield are some of the previously mentioned Aeldari, for those with very short term memory; Guardians, and Wraithguard taxi - the Wave Serpent. Skulking within the ruined building are the soon-to-be-very-annoying support weapons and Farseer. Also the Dire Avengers are there too. 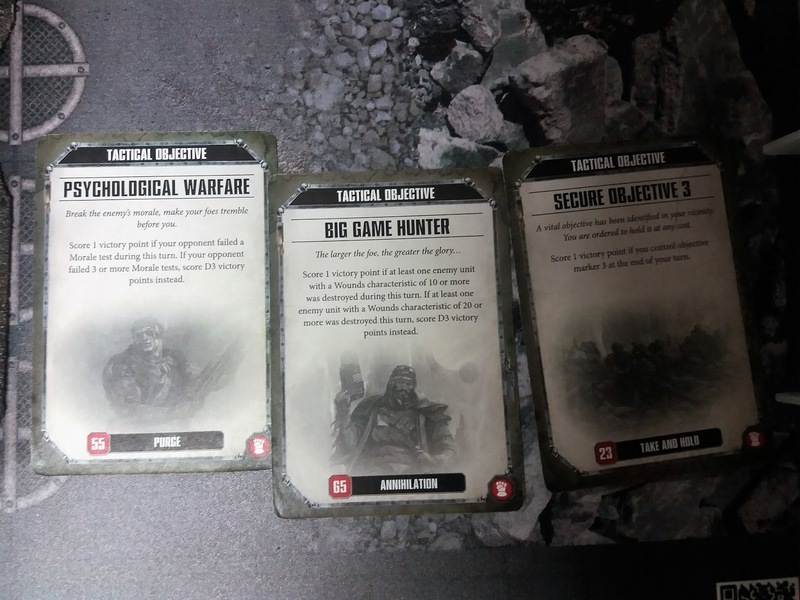 My first tactical objectives; Psychological Warfare, big Game Hunter and Secure Objective 3. Neil won the first turn and started his tacticals. Both Wave serpents sashayed forward as did the Guardians and Farseer. The Farseer then began to interfere with my Ratlings quite severely with his mental powers, Smite and Executioner were both used to render the unit rather small. Only after most of the unit was removed did Neil realise he had messed up his cunning plan somewhat. Neil is a great fan of the Fire & Fade strategem with his Farseer darting in sending some mind death to the enemy shooting them up then dodging behind something to prevent retribution. Sadly for him (and happily for me) he hadn't moved the Farseer close enough to my Ratlings leaving him unable to shoot. Even more happily for me I had quite a bit of heavy weapons able to target the Farseer so my shooting phase should be eventful. 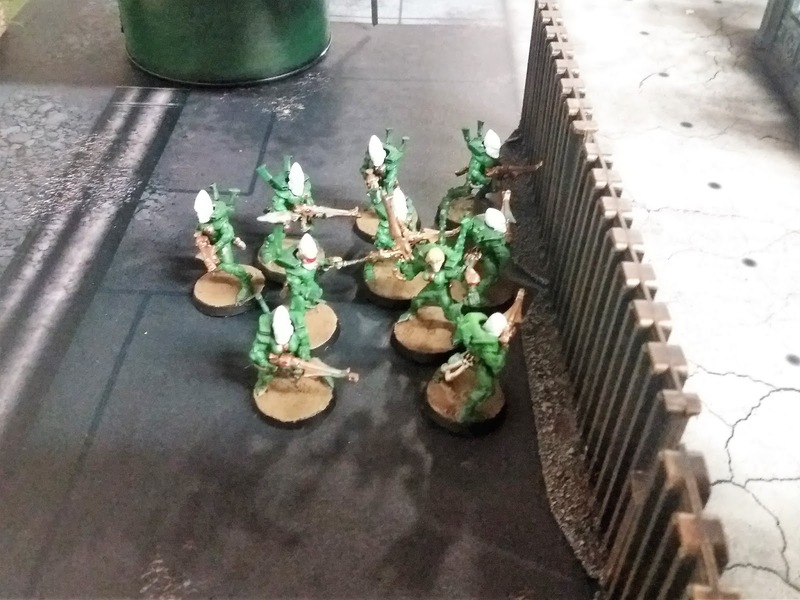 The Aeldari shooting phase was pretty nasty, putting a lot of guardsmen into a less active state as the picture below will show. 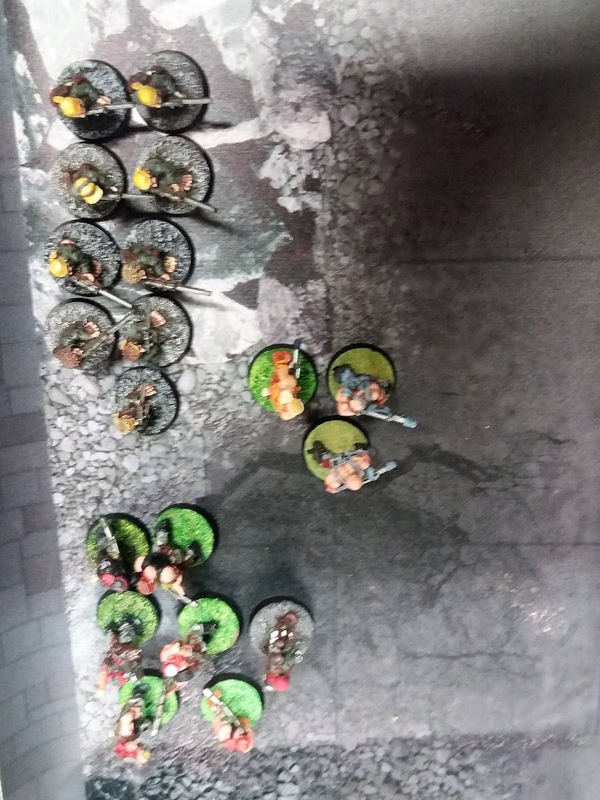 In the morale phase the lone remaining Ratlings scarpered but my other guardsmen unit stuck around for some payback. The lamentation of the Scargill women can be heard as can the wailing of dozens of pie manufacturers on behalf of the deceased Ratlings. 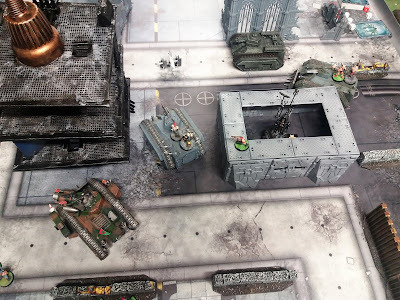 Despite losing some guardsmen the Imperium is not overly worried yet. The Meltagun vets have their own personal company commander with them, for motivational purposes mainly. 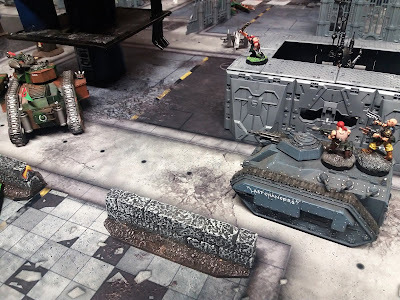 A lone sergeant minds an objective that no one seems to want at the moment while choking on the fumes of several diesel engines (or worse - as it's rumoured that Scargill combustion engines use ground up Grox dung as an added ingredient to their fuels). 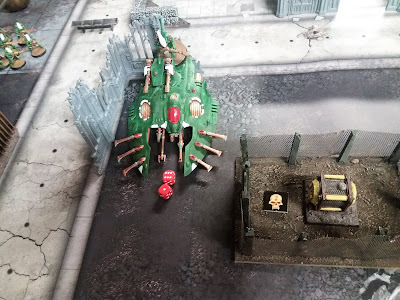 In the Imperial turn the Scargill PDF had the beautiful sight of an Aeldari Farseer in pretty plain sight for a good 50% of my force. 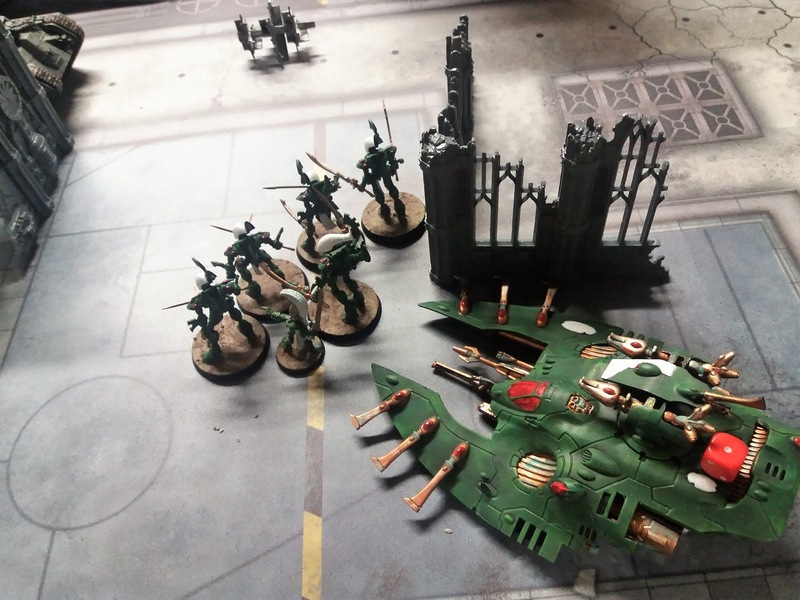 Having an Eldar army myself I know exactly how dangerous a psyker with Doom can be so made it my main priority. Needless to say two Leman Russ and some small arms fire dealt with the witch but as Neil had played the lightning reflexes strategem it was harder work that it could have been. Vengence for the Ratlings! 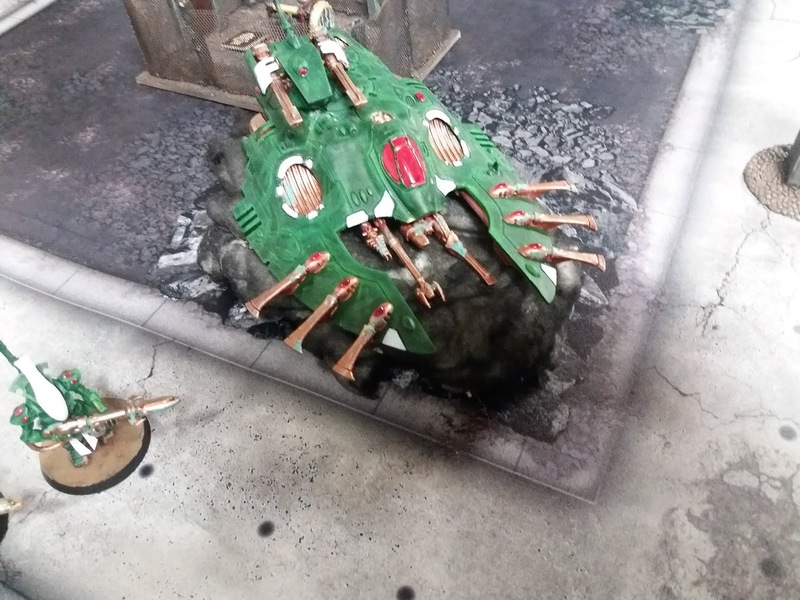 The Wave serpent on the Western table edge was damaged but the serpent shield is very effective against autocannon and plasma weaponry. No objectives were secured and the only Aeldari casualty was the Farseer, so no VP's for me. On to turn two where I get to find out about Wraith constructs! We very nearly destroyed the Wave Serpent. And when I say nearly I mean not that near, just scratched it up a lot. 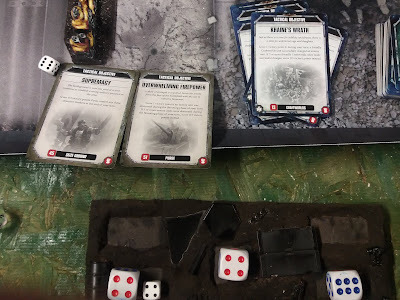 At the end of the first turn, things are pretty close. In turn two some of the Wraithguard/Blades made appearances. 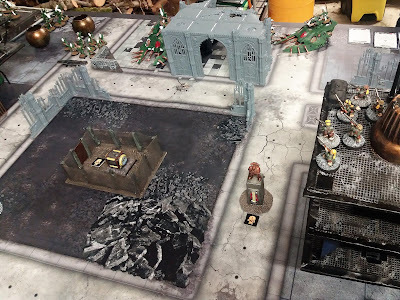 The Blades jumped out of the Wave Serpent near the Hellhound and the Spiritseer and Wraithguard jumped out of the webway in the bottom corner of my deployment zone as did two Warwalkers. 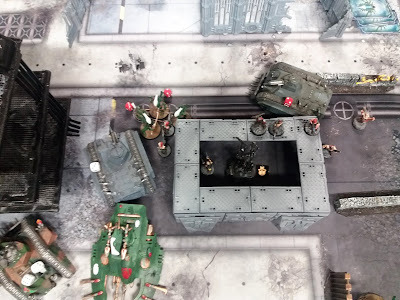 It was not a huge surprise to me but during deployment I had considered placing something in that corner other than some of the transports to block off deepstriking hijinx but in the end didn't. Oh well.... After Neil's deployment his Psychic phase was pretty quiet as I think the Quicken power was unsuccessful. 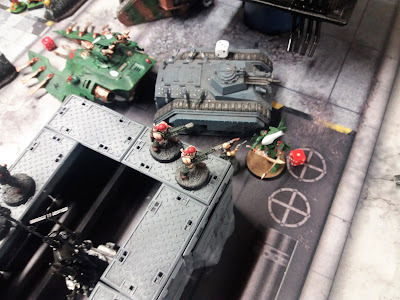 The Aeldari Rangers and artillery kept up their guardsmen killing duties and then the Wraithguard and Warwalkers destroyed a Leman Russ and shot up the Hellhound to boot. 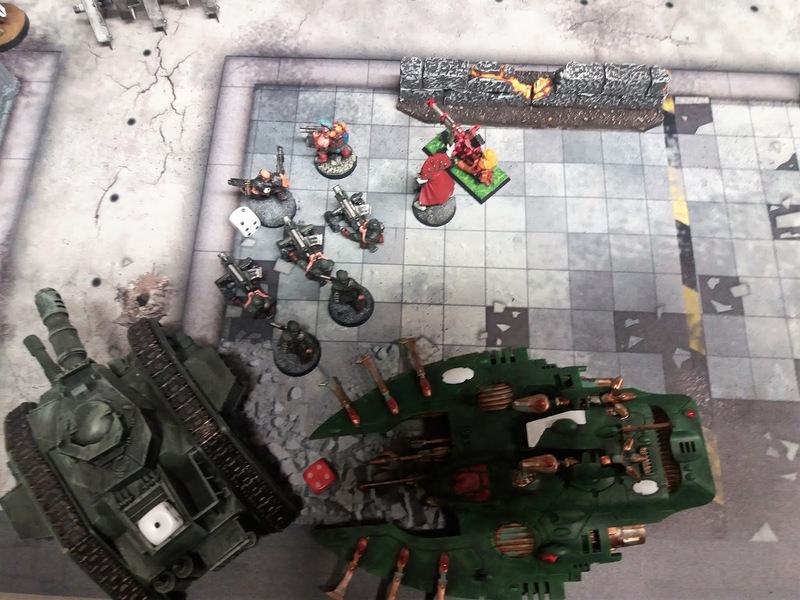 In the assault phase the Wraithblades made a long charge into the Hellhound and the Autarch came along for the ride. A swift and brutal close combat phase saw the tanks demise. Some mortal wounds were caused in the ensuing explosion but nowhere near enough for my liking. 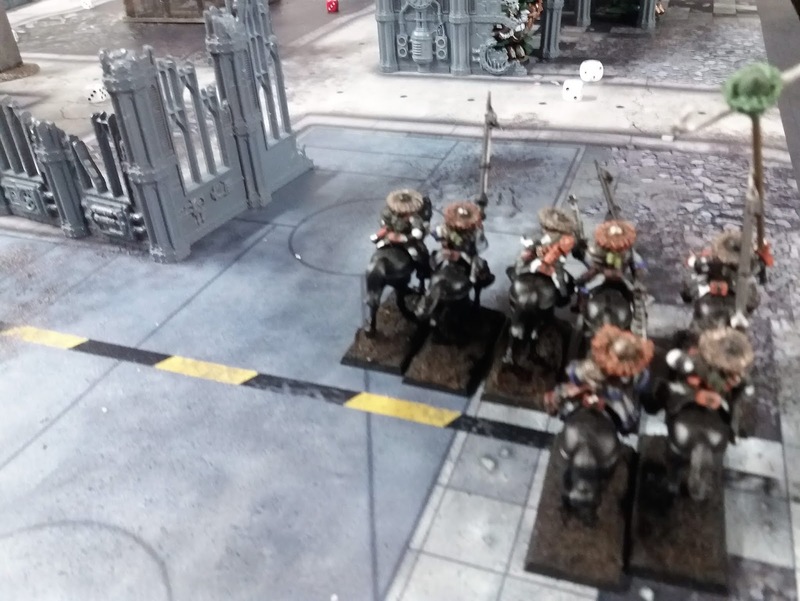 Some undead Aeldari constructs get out of their ride. They have swords. To their left is a nervous Hellhound crew (just out of picture). Dire Avengers decide that guarding artillery is a cushy number and have a pretty relaxed attitude to the battle. Winning the award for annoying back passage attack is the Wraithguard assisted by Spiritseer and Warwalkers. Note the now destroyed Leman Russ. Wraithblades are also very dangerous things! 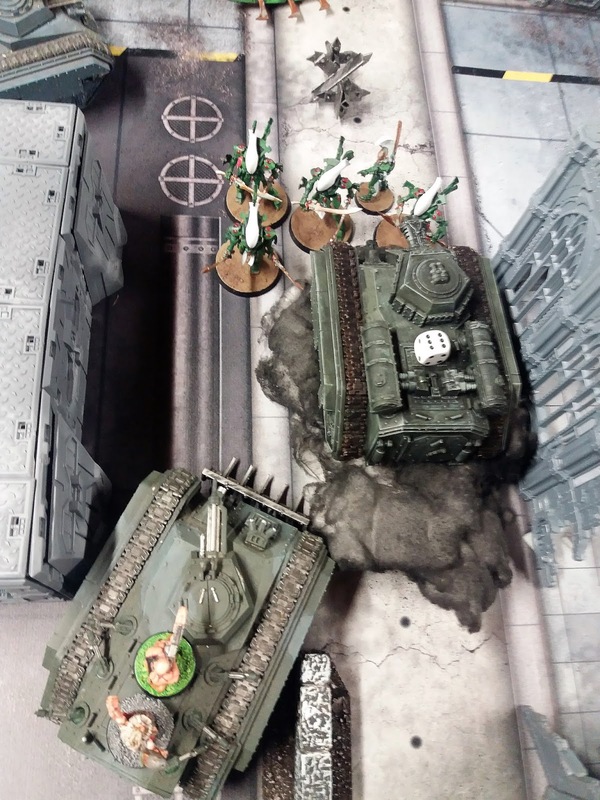 Losing two tanks in one turn is not what I signed up for. Some scant comfort was the three mortal wounds the autarch received from and exploding Hellhound! The Scroxix Hoghunter Dragoons were deployed as close to the Aeldari artillery as was feasible. So with the Aeldari proving to be quite adept at wrecking my vehicles I had to set about redressing the balance. As previously mentioned I have an Eldar army and have a pretty good handle on what to expect playing them. Wave Serpent's serpent shields nullify autocannon's 2 damage and plasma weapons on maximum power making the transports very durable. What I hadn't actually considered is how tough T6 infantry with high strength weapons are. They are very tough. So much so that I had to pump an inordinate amount of weaponry into them. 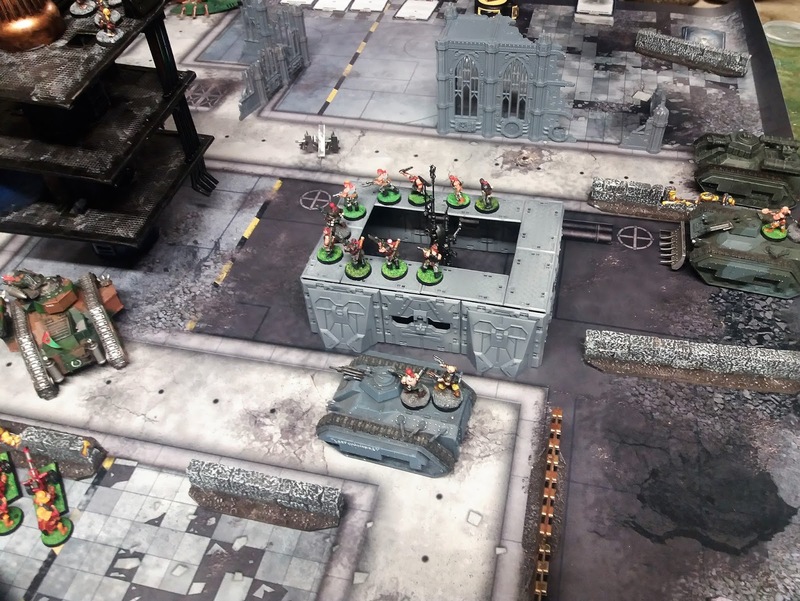 Lasguns need 6s to wound so they are on the borderline of futility shooting at them with troops. But shoot at them I did. 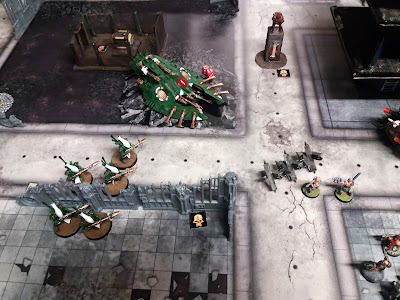 A couple of events in the shooting phase had quite an effect, firstly my excitement at shooting all those Aeldari caused to to forget to issue orders this turn. Very annoying when I was going to have the Plasmagun vets rerolling 1's when they shot up the Warwalkers. 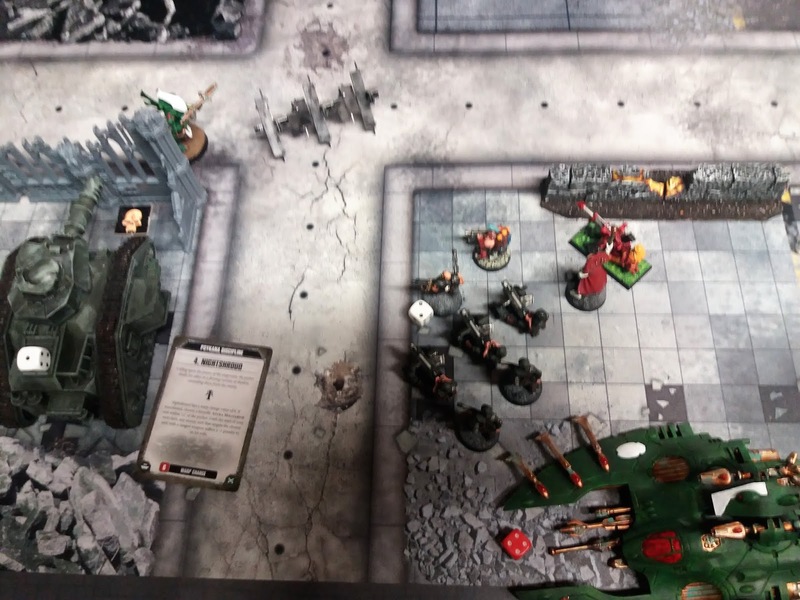 Two vets died to their over overzealous use of maximum power. 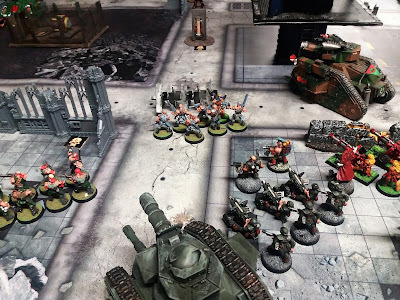 The other annoyance was the piss poor performance of the unit of meltagun vets against the Wraithguard. Failing to damage enough of these things with a fusillade of shots was very frustrating. 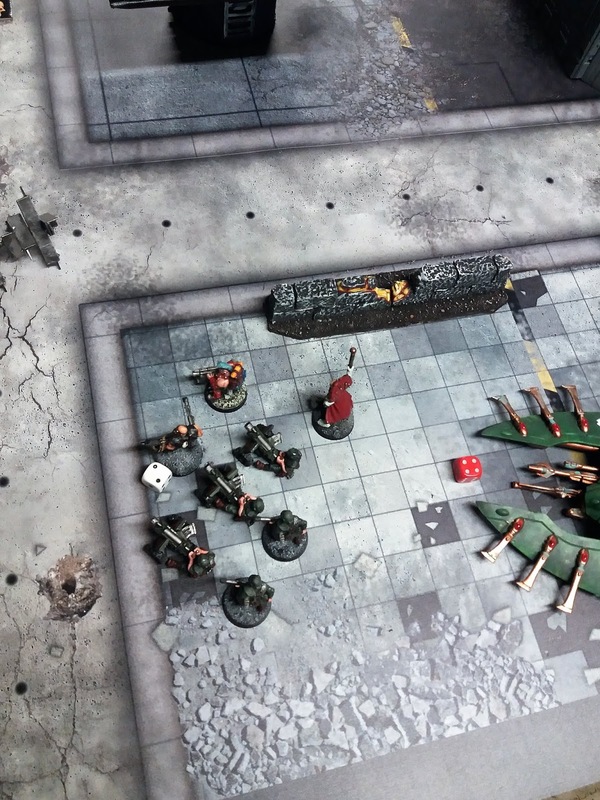 Not much pictorial evidence of Aeldari turn three. What did happen was the Wraithguard in the westerly placed Wave Serpent (you know the one with a single wound left) jumped out. The Dire Avengers advanced on the Roughriders, the Spiritseer jumped back over the wall as he wasn't nearly as brave when all his Wraithguard were lying in pieces near the autocannon troops. 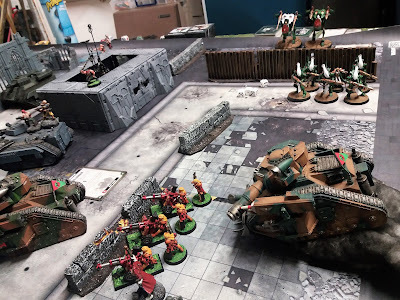 The easterly placed Wave Serpent flew over the Chimera and the Wraithguard shot at, then assaulted the meltagun vets.The Rangers kept shooting at the few guardsmen still in range and the Guardians were doing what I can only describe as 'skiving'. 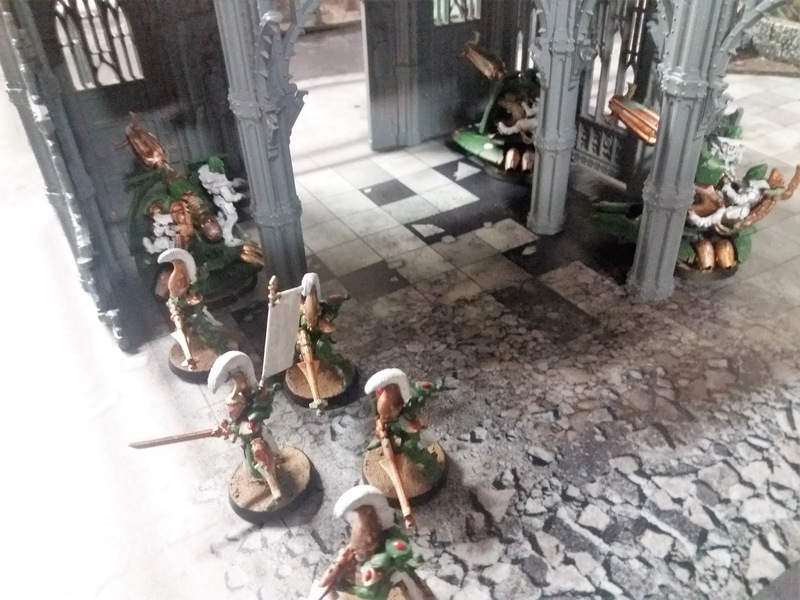 They were unlikely to get into combat or effect the battle so in good soldierly fashion they 'misinterpreted' orders and stood around for a turn. 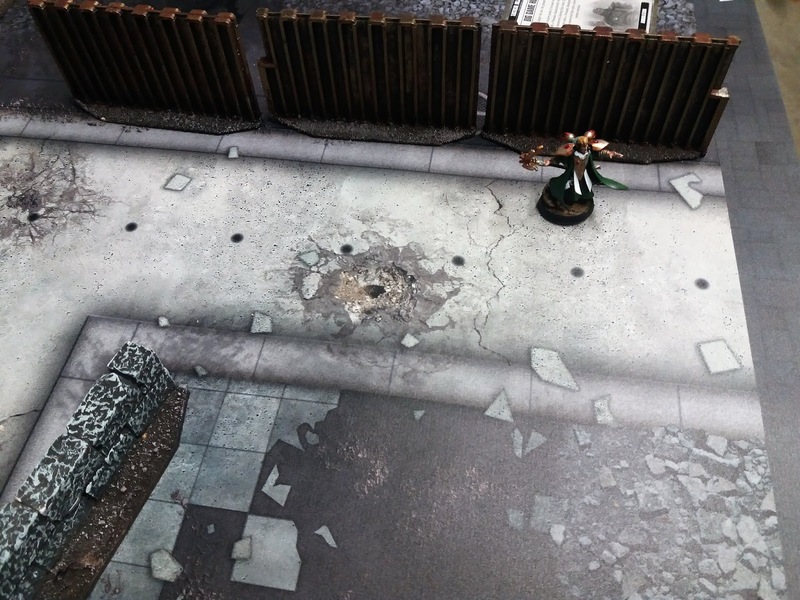 The Aeldari artillery were still accurate leaving many dead humans around the place. One thing that did go my way this turn was the dire avengers attack on the Roughriders. 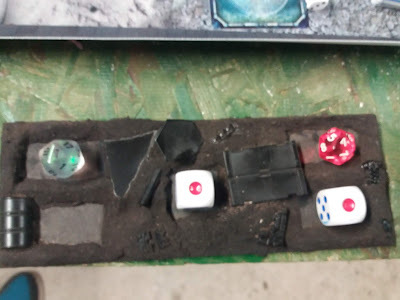 They first shot them up with some appallingly bad dice rolls, then charged in, losing the Exarch to overwatch. To add insult to injury the Avengers did little in combat and were then soundly trounced by the cavalry! Phrases like; 'jolly good show' and 'that'll teach the bounders!' were probably uttered as well. As is often the case, the horses were more effective than the riders. The Wraithguard attack my vets is hand to hand and the Wave Serpent uses the fly rule to annoying effect. 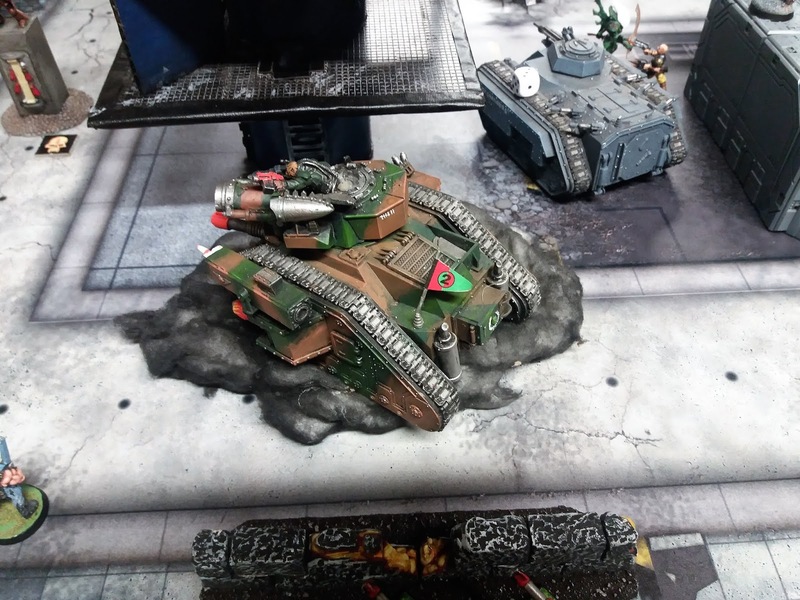 The final unit of Wraithguard shamble out of the Wave Serpent and the crocked transports putters towards an objective. Out of picture is my final intact Russ and just in the picture is a pretty outtact one as well. 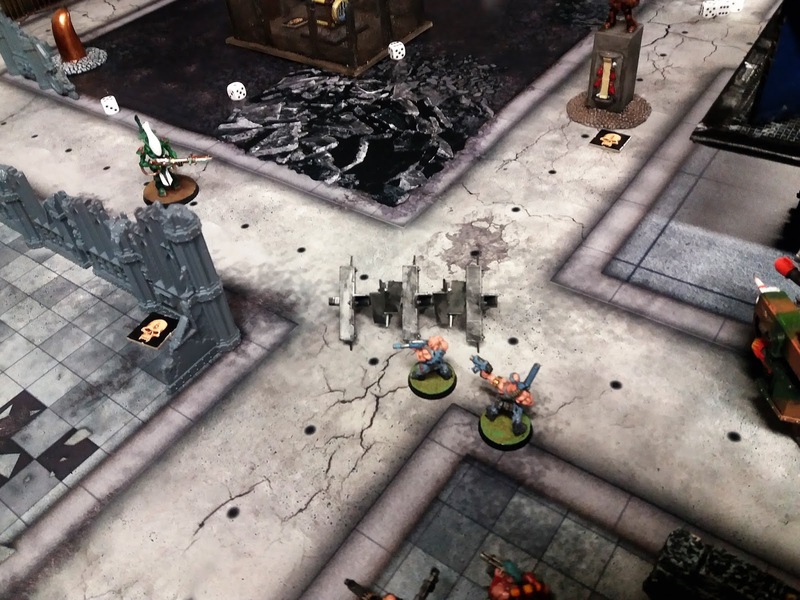 The Dire Avengers decide to earn their money by attacking the Roughriders. Little do they know the Roughriders are armed with 'purebred steeds'. This is an ex-Wave Serpent! The scores at the end of Neil's turn three 5;4 to the Aeldari, Two meltagun vets pull the old switcheroo. 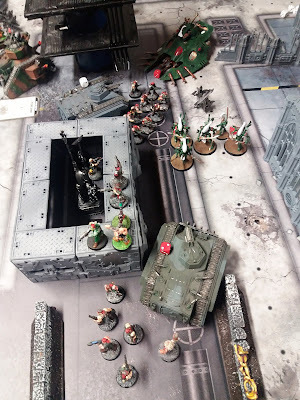 The company cammander gives them the "get back in the fight!" order and then he piles in to finish off the lone wraithblade. He will probably bag another shiny medal for it too. In my turn I was running out of viable assets (sounds very military, right?) so I had to get stuff done. One of the few remaining vehicles scooted over to the central objective and the roughriders moved towards the Aeldari artillery. 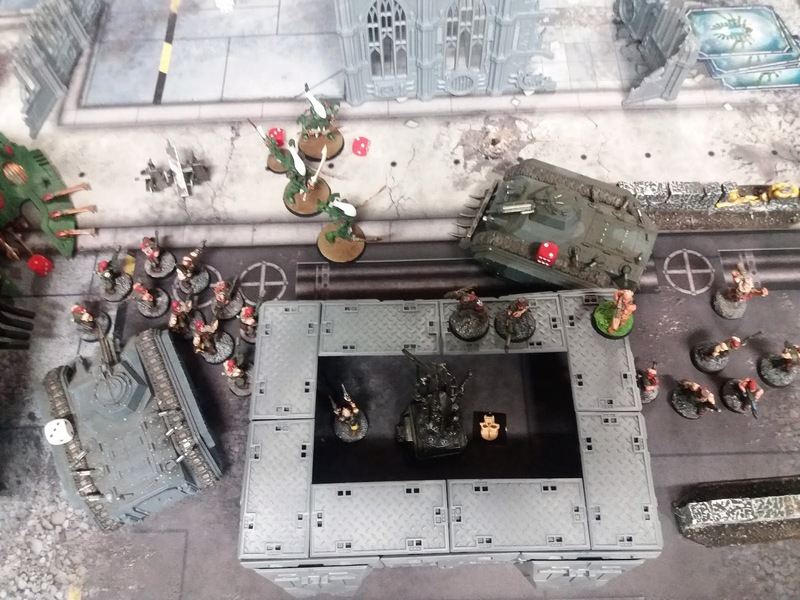 My right flank was being held by a Leman Russ, company commander, sergenat Harker a Wyrd and some heavy bolters. Various infantry were now hunkered down minding objectives. Some more Aeldari died in the shooting phase. The only assault was performed by the Roughriders into the closest artillery piece. Wounds were exchanged but no one ran away. The Dire Avengers are gone, now it's time to poke some artillery pieces with lances. My objectives this turn, defend objective 4, supremacy and overwhelming firepower. Get some, Aeldari! 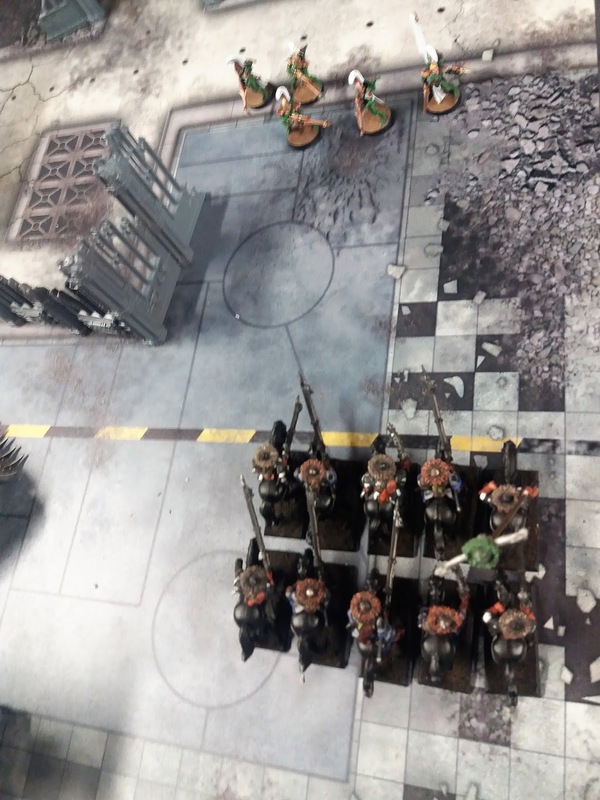 In Neil's turn he targeted the troops around the Psyker so he could kill him with the Wave Serpent as he would then be the closest target. Once the autocannons were out of the way it was death by shuriken for the Primaris Psyker. He also shot and blew up the Chimera by the objective in the centre of the table with the last remaining Wraithguard. Knowing that I had the supremacy card and the final turn (it was getting pretty late by this stage) he assaulted the Leman Russ and was shot down like a dirty Eldar dog for his troubles. In the close combat phase the Roughriders managed to kill off the first artillery piece and consolidated towards the rest. Some safe as houses Guardians. Also safe are the Rangers, mainly because the only things I had the range to attack them with had much more pressing problems nearer to them. The Russ and lone Wraithguard fight over an objective. The Wraithguard kills my Chimera. Assisted by Warwalkers (probably). My Psyker is running out of human shields. The best remedy for imminent death from a hideous, homicidal alien vehicle is to probably stare off into the middle distance and hope that shuriken isn't very painful. So the final turn of the game was slightly anticlimactic and exciting at the same time. The anticlimax was the roughriders assaulting the artillery but it was a bit of a slapfest. I managed to kill another unit (admittedly it was the Wraithguard in Neil's turn soanother VP was gained). We counted up objectives and I had three so duly rolled the d3 VPs and got a 6 (or a three if you want to be pedantic). Scores were 8:6 to the Imperium. I had snatched victory by rolling a 6 on a dice! The final score. I flukily rolled a 6 for my d3 VPs for supremacy and that was decisive. That was a close one. As this was my first game against Neil and first one against Aeldari in yonks I must admit it really good fun. Neil's army is full of stuff I don't really use in my own Aeldari army and I can really see the appeal of both Wraith constructs and Warwalkers. The Biel Tan warlord trait is also pretty nasty and was used to great effect with both Wraithguard and Warwalkers. 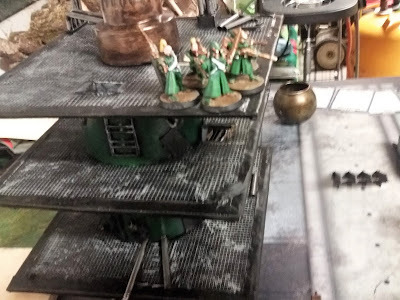 Neil's mistake in turn one with the Farseer was quite important. The amount of damage that the Farseer could have wrecked is considerable, but if I hadn't shot that up, some other Aeldari troops would have felt the Emperor's Wrath. I think my own gaping hole in my deployment zone softened the blow somewhat for Neil so he could deploy a rather unpleasant number of highly powered accurate Eldar weaponry just where it was needed. Other things I could have done better was not forgetting to give orders at a pivotal point and my use of the Laurels of command, Leaving them at the back surrounding my heavy weapons is pretty pointless as Sergeant Harker effectively gives everyone within 6" Take Aim! A much better use would be to use possible extra orders in a more forward role. I think the Roughriders were fine, but with the new price decreases for a lot of Astra Militarum troops I could probably put a couple of meltas in that unit. Speaking of meltas I think I probably need a lot more especially if I have to deal with that amount of Wraith constructs. I would like to blame dice for some truly strange inconsistencies but I seem to remember both times Neil's serpent shield failed each time he attempted to use it! It probably all worked out average in the end. 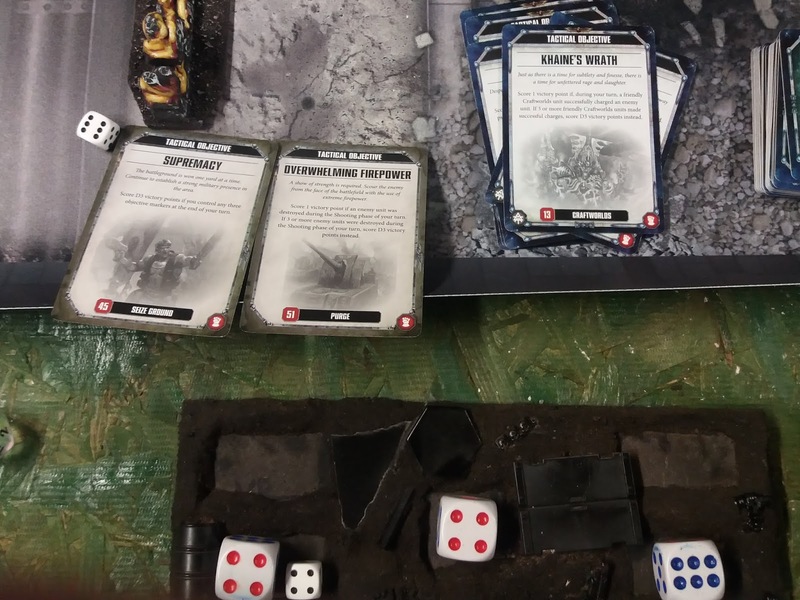 So I hope Neil enjoyed the game as much as I did, and hopefully next time I may be able to use my own Aeldari against him. Although with the imminent release of the new Genestealer Cult Codex, I may have to dust off the baldies! Stoop was now a smoking ruin. The Aeldari had fought hard and to be honest although they had departed the field, they had left few casualties. There were many destroyed constructs that the xenobiologists would take custody of in all probability. Of concern was the shredded body of Vim Ajax, another of Balto Krudditch's close associates had been horribly wounded and it seemed unclear whether he would survive. The company commander sighed. The next ream of asset requisition forms would have to be completed as quickly as possible as this part of Scargill was becoming the go to place for alien races and heretics wanting a scrap. 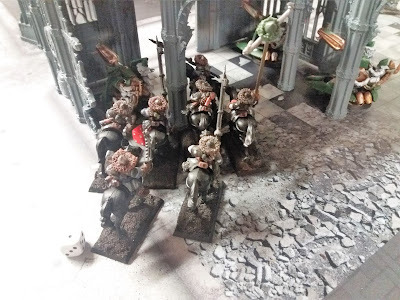 On the plus side the Hoghunters had proved useful in distracting the alien artillery and Krudditch decided to try to get some anti tank weaponry for them. With that thought in mind he started yelling for Crolly Mirkle; valet, batman, ale taster and paperwork validation engineer. "Crolly, how big a gun can we fit on the roughriders?". "Not that big, Sah, I'm afraid. We may have cavalry sized meltas". "Very good, we'll have to get some some for all these alien tanks that keep showing up". "Very good, Sah! ".